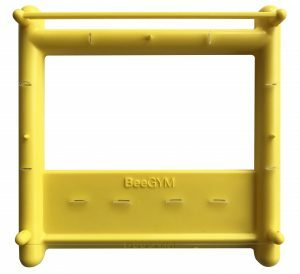 The Bee Gym is a patented device to assist and improve grooming behaviour in honeybees to help them to control varroa mite populations. The Bee Gym was developed on the principle that with a simple device bees can be encouraged to groom themselves more effectively to remove varroa mites. With its unique combination of specifically designed grooming aids, the Bee Gym encourages and enhances the natural grooming behaviour of honeybees, assisting in the removal of varroa mites from the colony. The Bee Gym should be used as part of an Integrated Pest Management approach to varroa control. 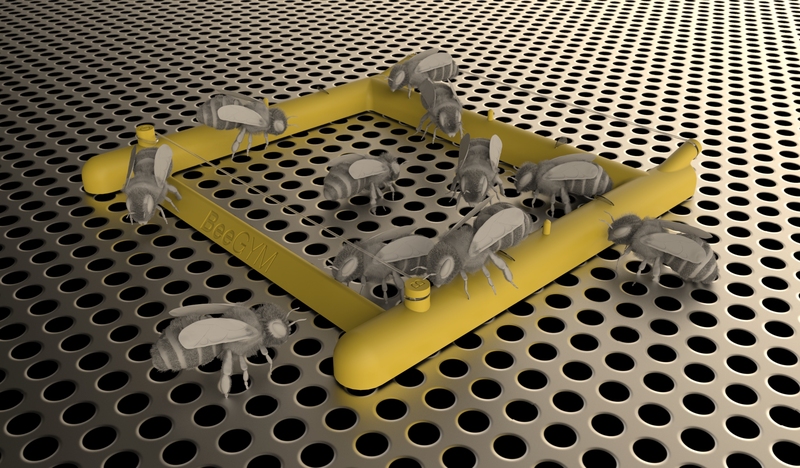 The Bee Gym is the world’s first grooming assistance device to help bees rid themselves of varroa. 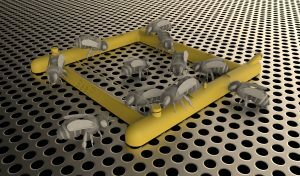 The Bee Gym is a framework of wires which enable bees to scrape varroa mites off their backs, together with flippers and scrapers that help the bees to remove mites from their abdomen. Dislodged and damaged mites will fall to the bottom of the hive, so an open mesh floor should be used and emptied regularly. Bees voluntarily use the Bee Gym throughout the year, including during a honey flow, and even form a winter cluster around it to enable improved grooming during cold periods. The Bee Gym is extremely easy to deploy, simply place it on an open mesh hive floor during a routine inspection. The Bee Gym can then be left in place all year, save for an annual clean. The Bee Gym should be positioned in a busy part of the colony, either on the mesh floor about 2 cms back from the hive entrance or on top of the brood frames in a shallow ‘eke’ or spacer. Orientate the device so that the Bee Gym name is uppermost and faces the opening in the hive entrance block. Check that the wire loops are tight and that the flippers are located in their sockets. The wires and small plastic flippers point upwards. To maintain the Bee Gym, soak it in a bucket of soda solution, then replace within the hive. The Bee Gym can stay in the hive all year round. Chemical Free: Bee Gym is a physical grooming aid for bees. Economical: Bee Gym has high durability and no on-going costs, making it a highly economical investment. No extra apiary visits: Bee Gym can be left in the hive all through the year. Specific: foragers returning with full pollen baskets choose to avoid the Bee Gym, so there is no risk of pollen being lost. Sustainable: Bee Gym encourages the natural grooming behaviour of honeybees, resulting in more hygienic colonies, better able to manage varroa infestations. Integrated: Bee Gym is an ideal component in an Integrated Pest Management approach to varroa control. Leave a space between the hive entrance and the Bee Gym so that pollen-laden foragers are able to avoid the framework. Ensure there is sufficient gap (at least 15 mm) for bees to move around the Bee Gym to fully utilise it. Clean the Bee Gym with washing soda periodically to remove excess propolis. Don’t worry if the bees propolise the frame a little – the grooming flippers and scrapers will not be affected. The Bee Gym is currently available in the UK (from Paynes Bee Farm, Heather Bell Honey, Beckys Beezzzs, Solway Bee Supplies & E H Thorne); the US (Dadant); Canada (Bee Maid Honey) and France (Ickowicz). More stockists will be added soon.